To further assist farmers looking to sell into wholesale markets, the Cornell Vegetable Program has put together some helpful tools. 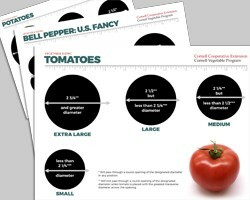 The tools provided here consist of a color photo guide highlighting the grades of some of the most common vegetables grown for wholesale market in WNY. To aid in the visualization of the grading sizes, the crop templates provided below are scaled to size (8.5 x 11 paper). They can be printed and used to create sizing templates to be used by workers on the wash and pack lines. The accompanying PowerPoint PDF found below, Making the Grade: Grading and Packing Fresh Produce, will give growers an overview of what buyers are looking for and why. Selling wholesale isn't for every grower and having the information to make these important decisions is crucial. For more information within the Cornell Vegetable Program region of WNY, contact Robert Hadad. Other resources are United States Standards and Grades, Purdue Agriculture - Illustrated Guides to Grading Vegetables, and UC Davis Produce Quality Rating Scales and Color Charts - Postharvest Technology Center.